Participatory research and design are common and established ways of adults working with young people, with the intention of genuinely including the ideas and creativity of young people. There are concerns, however, that adults create contrived spaces of participation where young people are pushed through a process that has been predefined by the adult researchers’. Instead, DRGL explores the question of how adult researchers might create spaces and opportunities for young people to come together and self-organise to do or achieve something in which they are interested. The project will bring together two groups of 8 young people from Manchester CoderDojo and the Woodcraft Folk to respond to a ‘challenge’ to self-organise a project with a £3,000 budget. This process will be researched from two perspectives: The adult research team will reflect on the process of letting go of power in a research project and how the young people engage with the challenge. The young people will document the project, using the approach and media they most prefer. One of the difficulties we didn’t foresee when planning the Design Research Get Lost (DRGL) project was in finding times for the young people to get together. The memories of my childhood are mainly of lying on the sofa watching TV, playing run-off and lazily boating my way down the Mississippi river… although that’s probably Huckleberry Finn. Young people today are busy. There were school trips to France, scouts, other projects, exams, hack camps… the list went on. Nevertheless, we got together with 3 coders and 3 Woodies to start the project last Thursday night. 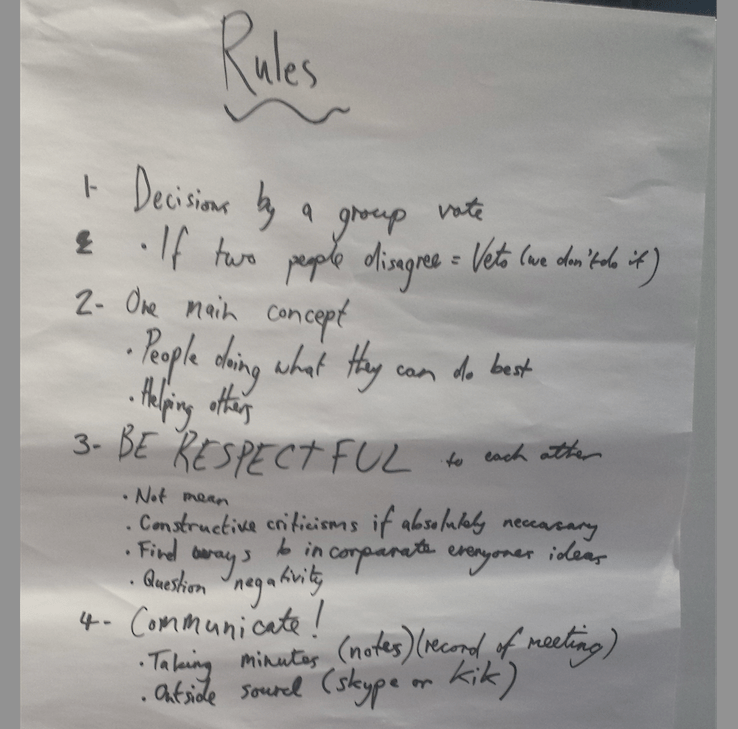 The purpose of the meeting was to present the young people with the ‘challenge’ (see below) and to develop a list of supplementary ground rules (see below). Then after discussing the way things would be organised the coders and Woodies explained what they did, how it was organised and what they were interested in. This discussion was meant to foreground the identification of areas of commonality around which the group might come to develop the project. It was interesting how both groups tried to anticipate the interests of the other and suggested appropriate ideas. The coders didn’t know much about the Woodcraft Folk or what they did but thought it might have something to do with working with wood, so one coder suggested that they could make a wooden case for a computer. I think that would be awesome! Reflecting on the research, the idea behind the project was to see what happens when adults/ adult researchers present young people with a set of conditions (the ‘challenge’) that might facilitate some form of productive self-organising activity. In practice this didn’t happen as suddenly or perhaps as purely as envisioned. Gradually we researchers stopped talking and left the group to its devices. There were interesting dynamics around letting the young people get on with things or supporting them when it was apparent they might be about to ‘drop the ball’. At one point the young people were discussing who was going to do what but they weren’t writing down names against activities. One of the Woodcraft Folk adults pointed this out and they discussed the importance of minuting meetings. I found this interesting because I felt it was a point at which the group may have encountered some difficulties and not progressed as quickly with the task. As part of the project I would like to explore the basic forms of organisational technologies that might complement the ‘challenge’. It was significant that when they’d written down notes of who would do what one of the Woodies made a point of asking each member of the group what they had to do and if they understood what that meant. I’ve been in many a meeting when everyone seems to say ‘yes’ to everything to speed things out the door, so I thought this demonstrated a clear understanding and forethought of how things can go wrong. I traveled from Lancaster to Manchester. I met James and Giuseppe at the train station. We walked together to Manchester Metropolitan University. Today is actually the start of the project. We will meet two groups of children in the Education and Social Research Institute at Manchester Metropolitan University. The idea of the project is to bring two groups of children: coders and Woodcraft, both have their own impressive skills and abilities in digital making and self-organization. The project is funded by AHRC. The main idea of the project is to “hand in power”; children will have a budget of 3000 pounds that they can spend on a “challenge”. Part of the challenge will be for the children to document and communicate their participation using whatever format and media they would like to use. In the following, I will critically reflect on my participation in the project . I will particularly focus on my reflections on the first workshop with children, held in June 2015. I will engage with the assumptions I initially formulated about this age group of children (10-13); some of which proved to be wrong. I will also present my reflections on being part of a multi-disciplinary research team. Thus, in this auto-ethnographic account, I won’t take things for granted but rather will step back and question the aspects I previously held. I will delineate the surprising aspects of the project, so far. Before I met James and Giuseppe at the Education and Social Research Institute at Manchester Metropolitan University (Sabine was in Germany and could not make it this time), we have already had e-mail exchanges and skype calls. My thoughts were that each one of us views the project from a particular point of view. Here we are sitting in the lounge waiting for the children to arrive at Manchester Metropolitan University. From the discussion, one question that James and Giuseppe have raised is how children will self-organize. Another thing we have raised is what digital practices children may engage with (which ties in with the increasing influence of web 2.0, new media and the idea of “digital natives”). I am also curious to know if the participants (children) might have any engagement with politics. In my PHD studies (at Lancaster University), one important theoretical question that arises is the idea of “democratic deficit”, which means that most of us (in Europe and the US) have become disillusioned with politics and politicians (e.g. see Wodak 2009). One thing I am interested to explore is: will these two groups of children (aged 10-13) may have any interest in politics, political participation or politicians?! It is important to know since this can help us overcome this democratic deficit, for example, by encouraging democratic participation among children, contributing to shaping their later views about politics/political participation. Well, after the first workshop, one aspect that seemed surprising to me is that the participants (children) appear to have awareness of aspects that we (as researchers and grown-ups) will qualify as part of democratic participation such as voting, subjecting ideas to reason and maintaining “respect” in discussion and communication. If you have come across that book i.e. the Structural Transformation of the Public Sphere by Habermas, you may easily identify the above mentioned-aspects with the conception of a “public sphere”, one that is based on rational critical discussion. To come back to a point I mentioned earlier, an aspect of the project that I have reflected upon is that it seems to be normal, and perhaps is a positive thing that the research team will look into a particular research project from multiple points of view. Maybe that is why multi-disciplinary research is positively-valued in academia, since this multidisciplinary can lead to a more in-depth account of the object of investigation. James, for example, seems to be interested in investigating children’s self-organization and its pedagogical implications, among other aspects; Giuseppe and Sabine appear to be interested in exploring how children will self-organize (e.g. who will take a leading role and who will act as facilitators?). And as I mentioned above, a question that I am curious about is whether children , if ever, may have any interest in politics. A third aspect I would like to comment on below is how we (as adult, researchers in academia) have interacted with children. As I will explain below, this aspect is important since it not only has relevance to research but also has relevance to the everyday practices and interaction with children. In light of our expertise, we would like to tell you: don’t underestimate children’s intellectual abilities. This takes me to the following section. Never assume children won’t understand! They are adults! Before the project started, a question that I have asked myself is how we will engage children in a community project. For example, how we will explain the research project to them? Will we use academic register such as “the aim of the project is” and terms such as “power” or will you use simple language to address them? And if so, what language will we use? As the workshop starts, I have observed how we interacted with the children. First, we have had an ice-breaker, then James introduces the aim of the research project. James has used the language that you may use in a research seminar. For example, he started by outlining the aim of the project; he explained that one aim of the research project is to hand in “responsibility” to them. James then introduced “the challenge”. We passed around papers (that looked like certificates) that explained the challenge. We asked children to read each point aloud. Then we asked children what ground rules they may like to develop to go ahead with this challenge. One surprising aspect is how children have engaged critically with each “ground rule” they set. For example, one participant pointed out that if participants disagree about a possible idea (for the project), they will not take it further. And when we asked how they will do this? Another participant commented that they will take votes and if two people disagree they would overturn the idea. Another pointed out that they would like to appoint someone to get the message across in case one of their peers is not present! A third participant pointed out that they can appoint someone to take the minutes! (minutes?! Just like departmental meetings, right?) Luke (the youngest) asked what minutes are. The participants in each group asked each other about their interests and the activities they do in their groups. Max, Barnie and Lucas asked the woodcraft folks what activities they are/have been doing. It turned out the woodcraft does not simply mean “doing woodcraft” but rather they seem similar to scouts in their abilities for discipline and self-organization. Delilah (to my surprise) mentioned something about politics. She pointed out that one activity they did was holding an international camp, involving many members from the UK and from other places in the UK. (To digress, it maybe worth noting here that the UK is- as Delilah describes- a truly multi-cultural country where people and ideas travel and interact). Delilah, however, seemed to have a particular view on politics and political participation. She pointed out that politics means having the ability to argue, exchange views and get heard! Sadly, I had to leave the workshop at this point for my flight to Egypt. I had to head to Lancaster where I would pick up my luggage and I had mixed feelings. On the bus, on the way back to the train station at Manchester, I have observed that there are many posters (big visible ones) advertising activities related to children, for example, drawing classes and book festival/s. I told myself that I would like to see posters (like those big visible ones) at Lancaster. I also thought about Egypt. I am really curious to see how the project will proceed. I think it is a great opportunity that we have the chance to explore social design in children. We can share the findings with practitioners in Egypt and elsewhere; and replicate the project in other contexts, juxtaposing and comparing our reflections and findings to get a wider picture of children-children and children-adult interaction. I have arrived at Lancaster. Today happens to be the last day for my stay in my place at Gressingham Drive at Lancaster. The start of the project, the encounters with the children and the reflections I have had about the nature of multi-disciplinary research are pretty rewarding after a long day. “What does being an adult actually mean?” Giuseppe’s post. This is a reflection on the first two meetings held with the two youth groups of children involved in the proposal ‘Design Research Get Lost’. The observation of how they children self-organise to achieve a common goal revealed personally unexpected insights about how effective they can be to the extent that I questioned ‘what does it mean to be a child’ and especially to be an adult when we talk about self-organization. How much as adults we assume that we behave and follow some rules with the other that children do not have because they can be acquired over time? Mixed feelings may rise when you are going to face a challenge, especially if you still do not fully know what you are going to do and who will be your fellows. Some excitement mixed with fears or doubts came strongly from the children at our first chat. 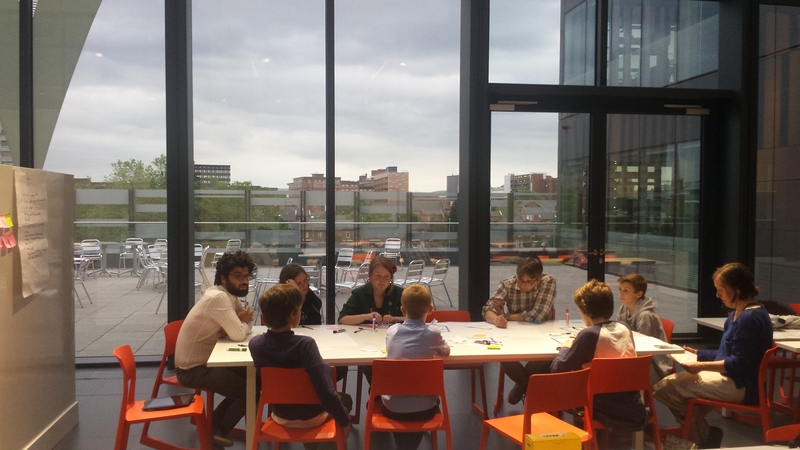 The members of the coding group, CoderDojo, arrived first (Max, Luke and Bernie, 10 to 12 years old) accompanied by their parents. We still do not know each other so we introduced ourselves and asked the usual questions such as “so you like coding! What do you like to code?”, “which other activities do you like to do?”. The children are a bit shy (low tone of voice, short sentences, taking time before answering…) but open to respond to the questions. After 30 minutes the members of second youth group, Wood Craft, arrived, Delilah, Jude and Nicole (15 years old) accompanied by two adult members. All together, we went to a spacious and bright room, sitting on a wide table, with sufficient space to share flipchart paper and post-it notes. We, investigators, thought that it could be an ideal venue, at least for the first meeting. Very soon it became clear that lots of assumptions or maybe generalizations are made when adults think about self-organising children. These kids were talking not only about the basic rules the investigators gave but also of the additional ones needed to facilitate the cooperation during the challenge, such as how to grant mutual respect and inclusiveness, and how to deal with diversity of opinions. I was not expecting such a level of sensitiveness and responsibility from young people, but maybe this attitude comes from the nature of the two groups, especially the WoodCraft (see Shaimaa’s description of the activities and aims of this group). The conversation then moved into idea brainstorming activity for the challenge, putting on the table such things as wide games (e.g. Pegged or Don’t remember), the use of visual device for augmented reality, developing a videogame and an app, and giving money to the charity. It was a discussion between experts, between peers who are knowledgeable of the trends, specs and figures and respect each other. These peers showed a striking attitude to share thoughts and build upon someone else’s ideas, whereby I am more used to (adult) peers defending or insisting with one’s own ideas. All these peers looked committed to carry on with the challenge and bring their contribution according to availability of time (both personal time and challenge deadline) and skills with which each of them could contribute. The discussion included budget, minutes, next activities for each member, means of communications (e.g. Skype) and social media, planning the next meeting until everyone was happy. Very often such a level of organisation and agreement is not reached (at least not so easily) in a meeting between adults. When asked how the (adult) investigators could help them, the members reported that they would appreciate a more practical support (namely when buying or accessing to tools). Therefore the adult interventions in the challenge were confirmed to be very limited thus granting the originally planned aim of observing as spontaneous as possible interactions between the involved members of the challenge. The high level of engagement in the discussion could have been partly facilitated by the experience in coding that all the young peers had, although at different levels. In fact, the member with less experience in the topic, Fay, was less engaged in the discussion (maybe also because she is quite shy, avoiding direct contact with other people) but her friend Delilah tried to involve her in the discussion whenever relevant. Actually Delilah led the discussion for most of the time. She appeared to be remarkably skilled in presenting, providing arguments and engaging people, even more than an average adult in my opinion. This attitude possibly influenced the development of the meeting in a positive way because all the members were engaged and ideas were constantly shared. The members of the CoderDojo appeared still a bit shy but did not give the impression to feel overwhelmed by Delilah’s engaging attitude. This was partly confirmed at the second meeting, held in the same room and attended by almost all the same peers, with 1 replacement in each group (Martha replacing Fay for the WoodCraft and Maddie engaged for the CoderDojo; Bernie was away on holiday). In that occasion Delilah looked much quieter and less engaging, difficult to say if this was done on purpose or because of a bad mood that day. The effect is that a leader and the related energy was missing during the second meeting. The peers shared some difficulties faced in the past days, such as setting up a group on Skype, using coding languages and opening social media accounts. Some of these difficulties sounded to me more related to lack of commitment in the challenge; in fact they were easily overcome and some tasks carried out by the end of the meeting. The peers agreed that they needede to get something done by the end of this second meeting, self-divided the tasks to carry on (e.g. coding and setting up social media accounts) and moved in two different tables. The interaction between the two groups was quite limited, maybe not facilitated by the layout of the tables after they split. Overall the meeting went well and the members looked active. However they did not do what agreed in the previous meeting in full, maybe because of the workload or the lack of commitment to the challenge when back at home. I stressed to keep in mind that as investigators we are there to help whenever needed and maybe keeping communicating with the investigators could have helped. Do the young peers feel fully engaged with the challenge, feeling it as their own challenge? For instance, they choose spontaneously quite corporate rather than funny names for their twitter (@Challenge_MMU) and Gmail (thechallengemmu@gmail.com) accounts, in which MMU stands for Manchester Met University, the venue where the meetings took place. What else the investigators could do to create the best conditions for observing self-organisations? The peers are a bit reluctant or not particularly responsive to one of the seven rules given, that is communicate with the organisers although it has been stressed a couple of time to send regular communications of the challenge progress, even a single line or a picture. I made a very short interview to Max, Luke, Delilah and Judith, asking to each of them their name and group, impressions of the challenge and of the collaboration with other people. Regular video interviews could actually help to get individual impressions. A sense of ‘worry’ has started to emerge within the researcher team. Not sure whether giving up power has been such a difficult thing to do over the last few weeks, considering that the research team has been busy getting on with other project related work. Even so, the question of whether this whole project might fail has started to emerge again. We knew from the beginning that nothing tangible might derive from the work… but what does that actually mean? So far, the children have been amazing at coming up with ideas and self-organising. They regularly communicate on Skype, have crowdsourced ideas for a possible event they could organise, opened up their own twitter account and use it, etc. Are these signs of success? Two children decided to no longer be part of the challenge? Is this a sign of failure? Whose success anyway – the research teams or project funders? Surely not, isn’t it all about the children? Closely linked to the success and failure discussion are debates about whether the research team is directing the process too much or too little. What is actually our role? During the third meeting, there were a few moments of silence that made parts of the research team feel rather uncomfortable… should we jump in. No, we are there to observe: adults observing children who were told by the adults ‘you can do whatever you like’. Rather than giving up power, it feels more like a friendly interactions between throwing power like a ball from one person to the next – all unsure whether to take it or not and definitely needing to ask for permission whether it would be okay to just take it. In all of this, ideas have started to become rather concrete. The design of the ‘wide’ game still is of interest to the group and to create a launch event around it so that they can invite some of their friends to play it. Discussions about possible venues started to emerge: would it be better to be inside or outside, will there be Wi-Fi, etc. and what could attract other children to come along: maybe a bouncy castle… Notes are being taken, tasks are being allocated and reminders of the deadline come up. Towards the end of the meeting, the research team and youth groups seem to be relieved about the progress… maybe beneath everything there is the common wish to develop something that could be enjoyed by everyone involved. This is a chance for people to come together and have some fun – possible with some free ice cream. 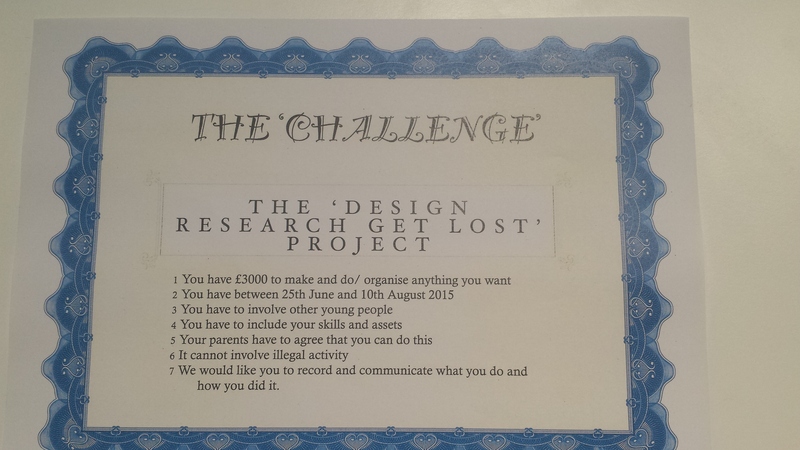 The ‘Challenge’ stated the young people had the opportunity to self-organise something by 21st August 2015, and in the run-up to nothing happening we adult researchers stood back as the deadline whooshed by. That we didn’t intervene was a stated and determined part of the research. The reason for this is that there are examples from the research literature on participatory research with young people that the professional, adult researcher with more experience but equally more invested in a successful project outcome will increasingly take control and deliver the project. Not intervening was something we were determined to do but it was not an easy thing to do. It’s important to recognise that lots of things don’t work out. There is for example a literature on the evaluation of non-events that is having to continue with the evaluation component of a project that didn’t happen (e.g., Charters and Jones 1973). My PhD was essentially of a non-event. There are various books such as Paul Ormerod’s book ‘Why Most Things Fail’ or Judith Halberstam’s ‘The Queer Art of Failure’. Indeed associated with start-up culture and lean practices there is a celebration of failure and ‘fail fast’ – although, of course, this isn’t fail constantly but fail in the pursuit of success. Extension Reason: The young people had a deadline to self-organise something (an event, a project or make something) by the 10th August. The rationale for the application was the research team would be prepared to let the young people not succeed, as in we weren’t going to organise the project for them. They’ve definitely had quite a difficult task in meeting one another, organising something and doing this over the summer when most of them have been on holiday. So it’s not been easy for them. We have, however, some really great young people wanting to finish the job and we’d like to give them the opportunity to succeed. The project they want to do is: Create a browser-based game that is basically a game of tag. They’re going to host a test day, with a bouncy castle and free ice cream. They’ll also play other games and tell people about ‘the game’ – a non-competitive game you can only ‘win’ if you forget you are playing it. They have plans for further developing the tag game and releasing it. We would like a no-cost project extension to enable them to finish the project. We’d like to convene a day workshop where they get together with a coding mentor, finish the code, and then plan the test/ bouncy castle/ ice cream day. Realistically we could host this day in the last week of September. This could be really useful for the research. We’ve learned a lot but I think a main finding is that a good way of letting young people to self-organise is to give them the time to discuss what they want to do, and then introduce them to other people with the skills and then they need a bit of support in the practical organising of things. Hosting the workshop day would help us test whether this approach works, rather than leave us with untested recommendations. Thus the main idea was to introduce the young people to two mentors – one for coding and one for game design – so that they could provide the requisite skills to advise and support the group of young people to realise their plan. What a difference a phase makes? We held another meeting and the group discussed our plan, one that had remained fairly constant since meeting 3; we would play a wide game (a treasure hunt), hire a bouncy castle and give away free ice cream all at a local park. Tasks to deliver the project were allocated between the group (marketing, checking to see if we could use the park) and everyone was meant to go and do them before the next meeting. The day after the meeting I became a little nervous, broke protocol and went to the park and started making enquiries. The ice cream seller in the park would take our money to give away ice cream. Then after many enquiries and emails I found the person at the council but in what I think was an understandable but still unnecessarily po-faced response (‘Ignoring for the moment the age of the event organisers’ and ‘an inexperienced group’) we were denied permission to use the park not least because it normally takes 8 weeks to get a decision on whether or not someone can use the park. Given the time taken to grant the extension by the time we had permission to continue we only had 4 weeks to deliver the project. My bad. So, what to do? Once we were in the second phase, specifically once the first deadline had passed, it did not make sense to leave the young people to their own devices or at the extreme left to ‘fail’ to self-organise something else again. During these meetings it was clear that they were turning up because they wanted to do something, wanted to finish what they’d started, but they were stuck. Not only were the young people stuck but we, the adult researchers, had thought ourselves into a corner and thought we couldn’t help out. We had introduced the mentors to the support group but the challenge of how they ought to interact with the group, whether they suggested or did, mirrored the research team’s problematic position but simply created a proxy set of adults into the mix. That the mentors were brought in to support the young people with coding and games design, skills that were beyond the original research team’s capacities meant that the young people’s participation wasn’t constrained by the research team’s interests and skills but this seemed to be insufficient. We needed to find a way out. I once read that the purpose of philosophy is the search for better questions, to distinguish bad questions from good questions and explicate why bad questions were asked in the first place. In this context, is ‘can young people self-organise something’ a good or bad question and why did it become a (research) question in the first place? The way we had approached the research was informed by a Foucaultian perspective in which we were wary guiding the young people through a participatory process and in so doing subordinating them to a practice and socialising them to serve society’s needs (Foucault 1997, Vromen and Collin 2010). However, as stated above, we were stuck in being able to decide when to participate or not and when the young people needed more support. We started to think differently when thinking about how we could produce treasure for the treasure hunt. On Twitter I saw a link for the Books for Syria campaign from the bookseller Waterstone’s. Book publishers had donated 96 titles to the shop to sell at recommended retail prices, averaging £8 per book, which would be bought by customers and the money donated to help Syrian refugees. Thus we could purchase a book where both the money and the book could be given away. Then while talking to the manager of a local community garden centre, she explained that she was just about to return to San Francisco to take back a much-loved book she found on a bus 17 years ago with the intention of leaving it on a bus for someone else to find. The concepts of becoming and assemblage helped the research develop a line of flight to another more experimental way of being. Returning to the question posed at the top of identifying better questions and understanding why questions are asked, we came to reflect on how we and the research came to represent the ‘young people’, ‘the project’, the ‘self’ in ‘self-organisation’ and the relations between these subjectivities and processes of subjectivation in relation to providing the young people with a meaningful experience that would benefit them in becoming something else. Indeed, the research team we were interested in the research as it would help us try out new theories and prepare us for more interesting projects. Thus we sought to work with the young people so they could challenge these fixed representations and assemblages of ‘youth’ and ‘youth-in-project’ to develop something more experimental and affirmative. We hosted a treasure hunt, using the ActionBound smartphone rally app, at the Hulme Community Garden Centre. Of the original group, Maddy and Jude remained and with their parents we turned an old shed into a community book zone, encouraged people to play the Hulme Treasure Hunt on ActionBound, gave away tea and cake… and had an amazing time. In total 8 groups went off on the challenge and once they’d gone around Hulme solving the clues and learning about Hulme (e.g., the first Rolls Royce factory was in Hulme) and completed challenges (e.g., singing to the ‘Princess’) they had the chance to play the human fruit machine (see picture) and ‘win’ to complete the treasure hunt. Then they received their prize, a book from the Waterstone’s ‘Buy Books for Syria’ campaign. We had registered the books on BookCrossing.com and asked people to pass the books on and register them when they shared the books with friends in the future. In the grand old tradition of local community events and fairs ‘a good time was had by all’ but how did we do in relation to working with a group of young people to self-organise a project? As these blogs have demonstrated, it could not be argued that the group of young people self-organised the community treasure hunt. The research was framed in terms of working with young people, affirming and testing that young people have sufficient assets to self-organise if given the appropriate conditions. The young people we worked with were incredibly almost deceptively articulate and effective at discussing ideas, compromising and negotiating. The idea to play a game and give things away in a broad sense was established at the first meeting. After numerous project meetings there were a number of variations on the idea – to programme a browser-based GPS game of tag, to use a particular park, to hire a bouncy castle – but in each case these proved for a variety of reasons unviable. The way the research team came to work with the young people was through progressively greater levels of support, specifically focused on moving from deciding what to do towards actually doing it. The initial plan of cultivating an empowering space but broadly letting the young people get on with things, succeeding or failing at organising things, was an uncomfortable research stance and one that once the first deadline had passed made less and less sense. Becoming is comprised of both human and non-human affective encounters that create opportunities to ‘perceive, move, think, and feel in new ways’ (Hickey-Moody & Malins, 2007, p. 6). It is in the midst of these encounters that the child moves beyond her own limits and experiences new modes of existence. These transformations have the potential to be liberating and even revolutionary as they involve fleeing from representational images of being in an entanglement of potential. In this way, becoming involves what is possible rather than that which reifies essentialized images of childhood. For more information: the project report is available here (soon).